Where The Science Is | A science and technology blog aimed at kids, adults and families where you can find science centered activities happening in the Washington, DC area and other cities around our nation. Hey y’all! So it has been a minute… or two… since my last post. 🙂 I hope everyone had a wonderful and adventurous summer. We had a very loose, unstructured, go-with-the-flow kind of summer around here for a change. The kids explored science and art but overall just had a good ole pool, outdoorsy, Mummy-comes-home-and-the-kids-are-all-dirty-ashy kinda of fun. I’m thinking I like the unstructured kind of summer for them… but we will see what next year holds. However, I am happy that school is now back in session and the kids are settling into their routines. I love the sense of normalcy and sanity routines bring! …and speaking of normalcy, back to blogging! There are some fun events in the immediate future – THIS WEEKEND – so I hope you all are free! If not, no worries. There’s lots of fun stuff to report for the fall so get those calendars out! Dulles Day Plane Pull – For those of you in the Dulles area, this is for you! The sad news is that this is taking place tomorrow, Saturday September 19. The good news is that it is FREE with tons of fun and interactive activities! Not interested in the Plane Pull competition? No problem! There will be a car show, aircrafts on display, and a kid’s zone complete with live music, bounce, and a “Dunk a Cop” dunk tank! Event will be from 11am – 4pm. 2015 Joint Base Andrews Airshow – Virginia has the Plane Pull on Saturday, Maryland has the Andrews Airshow! This is family friendly, FREE and open to all. Guests will experience aerial demonstrations and learn more about the military personnel and equipment; aircraft display and other fun activities. Gates open at 9am; the shuttle will run from 8am – 1pm. Maker Faire Silver Spring – Brought to you by the KID Museum, this is a FREE, family-friendly event aimed to bring together Makers of all types for a spectacular display of art, science, technology, craft and engineering. If you haven’t been to KID Museum in Bethesda, MD, you should definitely check it out. Read about our experience there in my first blog post. This event is on Sunday September 20, 12 – 5pm. Super excited about this one and we will definitely be there! Robinson Nature Center Anniversary Open House – Anyone who knows me knows this is one of my absolute favorite places to go with the kids. Located in Columbia, MD, the Robinson Nature Center is filled with little nooks and corners of science and wonder. From their bee hive, the nanotechnology exhibits, the Discovery room with a puppetry area and the planetarium… to the wooded trail and the garden filled with bees, butterflies and other little creatures, this center has lots to offer! In celebration of their 4th anniversary, their FREE open house will also be held on Sunday September 20, 12 – 5pm (Gosh darn it, right?!). There will be live animal presentations, live music­­, guided butterfly walks, face-painting, nature crafts and movies in the planetarium. Walk the trails with naturalists, explore the exhibits, and play in the Discovery Room. This promises to be a FUN filled day! But Decisions, Decisions! Which one will you choose? Virginia Science Festival NCR – The National Capital Region’s Maker’s Festival will be held at Virginia Tech on September 26, 10am – 4pm. Lots of hands-on experiences, live performances, and interactive demonstrations that will inspire a wonder in science for all ages! This festival is actually part of the statewide Virginia Science Festival that runs from September 25 to October 30. Check the Virginia Science Festival for other STEM events in that area. Innovation Festival – To be held on September 26 and 27, 10am – 5pm, the Smithsonian’s National Museum of American History will host an innovation festival – a collaboration between the Smithsonian and the U.S. Patent and Trademark Office. The festival will provide visitors with the opportunity to learn about the patent and intellectual property systems and how they support invention and innovation. FREEEEE and appropriate for all ages! Magical Monarch Butterfly Tea Party – Science and tea parties?! Yes please! So this event is organized by the Robinson Nature Center and let me tell you, it is absolutely delightful! I have attended these tea parties with my daughter several times, and I am really looking forward to this one especially because she is currently learning about monarch butterflies in school. The center usually has two or three a year with different themes; the last one was in July and was all about bees. It was super informative and cute at the same time. I learned quite a bit about bees myself and was so bummed I forgot my camera. This time I won’t! Enjoy a butterfly program in which you learn about the beautiful monarchs that migrate through our area in the fall. Followed by a butterfly-themed craft activity and a catered sit-down tea service by Sweet Simplici-Tea tea room, this is one not to miss! Fee for the party is $45 for one parent and child, $20 per additional adult/child. Last time I checked there were only 4 openings left! Registration required. Don’t wait too long if interested. Total Lunar Eclipse – Join the Maryland Science Center staff in the Observatory to see a total lunar eclipse. The Full Moon on September 27 will be totally eclipsed by the shadow of the Earth. The partial phase begins at 9:07 p.m., totality is from 10:11-11:24 p.m. Viewing at MSC’s Crosby Ramsey Memorial Observatory from 9:00 pm-midnight, weather permitting. …and it is FREEEEEE!!! Scope Out the Night Sky – Another Robinson Nature Center event! I told you I love that place. 🙂 October 3, 6:30pm – 9:30pm, the Maryland Science Center and Robinson Nature Center jointly present this exciting, family-focused astronomy event! Enjoy a planetarium program, build your very own Galileoscope, hold a meteorite and take a tour of the sky outside with professional and amateur guides. Each family takes home one Galileoscope and all participants receive a star map. This one is for ages 8 and up. $24 per family (up to 5 participants). 32 openings left as of last check. Hispanic Heritage Month: Innovators in Aviation and Space – at the National Air and Space Museum in Washington, DC on October 3, 10am – 3pm. This FREE event celebrates the contributions of Latinos to aviation and space exploration. Learn about early aviators from the last century who took great risks flying the first planes and breaking records. Meet current Hispanic scientists and engineers. This is a great opportunity to learn about other cultural groups’ contributions to science! Brick Fest Live – This is one to get excited about! Held November 14 – 15 in Timonium, MD, Brick Fest Live was created to inspire, educate and entertain using LEGOS! 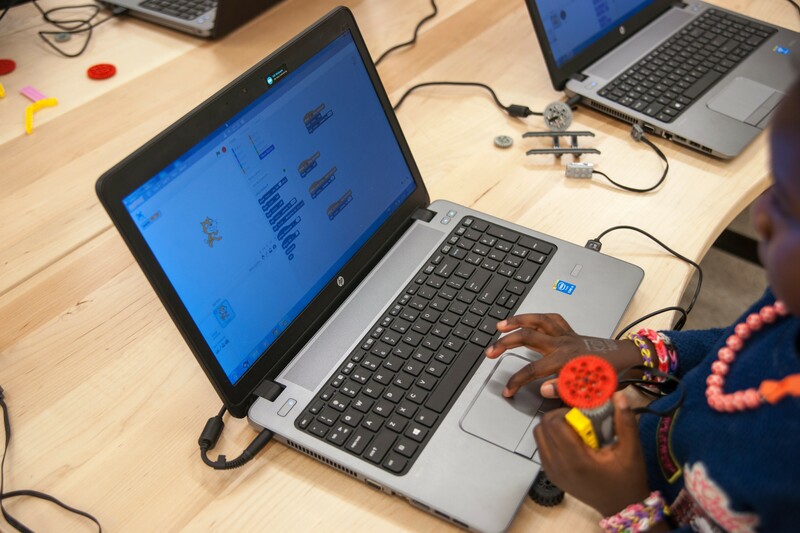 From simple Legos to coding and robotics, this event has it all! Tons of creative and innovative fun to be had. Get you mind ready and learn more about it here. Tickets are $25. Also, check out the website for Brick Fest Live in your city! So that is all I have for now. Looks like the weekend of September 26 – 27 is chuck full of fun things to do and see. Which one will you choose?! Drop me a note on Twitter or FB and let me know what you decided on. If you haven’t already, follow me on Twitter and FB because I do post events and information about science competitions and so much more on social media. I’m just going to leave this here… you know… to give us all some HOPE! Since we are all stuck here at home, might as well make plans for when the weather lets up right?! This is somewhat of an update to the Winter/Spring blog post but with more events and confirmed dates! Let’s get those calendars out! March 7: So I posted this on the Facebook Page a couple of weeks ago. If you haven’t done so, Like the Facebook page or follow me on Twitter; I will occasionally post events on social media in lieu of writing a full blog post. This is an event I am really looking forward to. The 2015 K-12 STEM Symposium will be held March 7, 9am – 3pm in Herndon, VA. It is a FREE and exciting all-day forum that equally engages children, parents, and teachers, coupled with corporate, government, academia and nonprofit executives alike from the STEM fields. Activities for the day will include: hands-on experiments for children, government and industry exhibitors, student science fair projects and panel discussions with STEM stakeholders. Each attendee will receive a Parent-STEM action plan geared towards nurturing a child’s curiosity towards the STEM fields. Registration is required. Celebrate this awesome day at the Maryland Science Center. Free pie samples, hoola hooping, shooting hoops, and hair-raising experiments to celebrate Albert Einstein’s birthday! Doesn’t get any better than that! Event is from 12noon – 4pm. Activities are free with paid admission. Admission is $18.95 for adults, $15.95 for kids 3-12years old. Keep in mind you may have to pay to park in a garage. Tickets can also be purchase online in advance. National Electronics Museum in Linthicum, MD is hosting the STEMulating Minds Pi Day Celebration from 10am – 2pm. Activities will include math and Rubik’s Cube competitions, arts and crafts, cookies and an opportunity to meet the Orioles mascot. The museum is offering a reduced admission of $3 for general admission, $1 for seniors and students, and free for kids 5 and under! Also on March 14: The Smithsonian National Air and Space Museum in Chantilly, VA will celebrate Women in Aviation and Science in recognition of Women’s History Month. The museum will host a family day that celebrates the accomplishments of women in aviation and space exploration. Visitors will have the opportunity to meet female role models and learn about the women who inspired them. Event is 10am – 3pm. Admission is FREE but parking is $15. March 15: NASA Goddard Visitor Center Sunday Experiment for the month of March will be held March 15, 1-3pm. Join the Visitor Center for a family-friendly, free afternoon of hands-on activities and experiments! Meet with staff from Goddard’s Earth Science division to discover what it means to be an earth scientist! Recommended for ages 5-10. March 21: Kites of Asia is an event that takes place every March at the National Museum of Air and Space in Washington, DC. Thrill to the beauty and artistry of kites on display and in the air. Visit the display of kites and discover the diversity of kites from across Asia. Find out more about how kites are made at the hands-on stations and how kites helped the Wright brothers develop the first airplane. Event is 10am – 3pm and is FREE. April 11: Explore the Universe Day is hosted annually at the National Air and Space Museum in Washington, DC. It is an opportunity to understand how different cultures see the sky, learn about telescopes and do some daytime observations (weather permitting). Event is 10am – 3pm and is FREE. April 25: Robot Fest 2015! I posted about this in an earlier blog but the date wasn’t confirmed at the time. This date has now been confirmed. Robot Fest is an annual event for anyone interested in the creative use of technology. This event will feature “roboticists, hackers, artists, hobbyists and makers of any age who have the unquenchable urge to develop and create new, previously unseen forms from lifeless electronics, fabrics and mechanical parts.” So. Much. FUN. See you there! Also April 25 – Ugh. I hate when this happens. Yes, Maryland Day and Robot Fest are on the same day. Maryland Day is a fun, interactive, family friendly event, with live music and food, that is held annually at my alma mater, University of Maryland College Park. Yes, Duke alums are welcome. 😉 This is a huge event that is sectioned off based on topic; of particular interest is Science & Tech Way which will feature displays and topics such as laser technology, extreme robotics, a wind tunnel, outer space, modern electronic devices and the weather. So is it going to be Robot Fest or Maryland Day on April 25? Choose wisely! Google Science Fair – 2015 Google Science Fair is now open for submissions! Google Science Fair is a global online competition open to individuals or teams from 13 to 18 years old. Submission deadline is MAY 18. Prizes are RIDICULOUS! If you are stuck there are loads and loads of information and help on the site. Good Luck! So that is all I’ve got for March and April. Follow on FB and/or Twitter for impromptu posts on any goodies I may stumble upon before the next blog post! As always, share and leave a comment if so inclined! I would love to know which activities you attended! 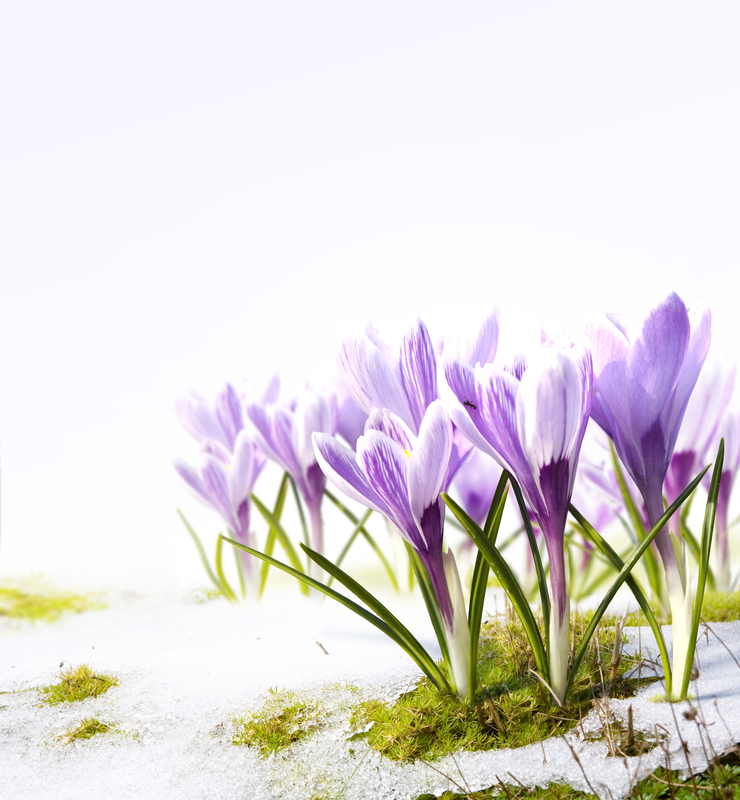 Stay warm and … Spring?! Soon! Pleeasseeee! So February it is, which makes it Black History month! Some background on me – I was born here in the U.S. but grew up in Nigeria. As such, African American history was not part of my early education and was something I didn’t start learning about until I moved back to America and started college. So I’m always interested and eager to learn all I can about African American history and the monumental contributions that African Americans have made to the America we know today. A significant aspect of said contribution is in the field of science and technology. Most Americans know about the more prominent scientists, such as, botanist and inventor George Washington Carver, his contributions to science and his career at the Tuskegee Institute; physician and astronomer Mae Jemison, the first black woman to travel into space; and astronomer and mathematician Benjamin Banneker. However, there are numerous African Americans inventors, scientists, and innovators that are not widely known and whose work we all benefit from on a daily basis. National Geographic has done an excellent job of curating some of these inventors and their work here, here and here. I encourage you all to take a look – I learned quite a bit! Smithsonian National Air and Space Museum – Every February the Museums celebrate the significant contributions African Americans have made to flight and space exploration. Visitors will enjoy “presentations, hands-on activities, and stories, and may have the opportunity to meet astronauts, fighter pilots, and others who will share stories of their challenges and accomplishments.” The Museum in Washington will host this all day celebration on February 21, 10:00am – 3:00pm, and the Steven F. Udvar-Hazy Center in Chantilly, VA will host on February 28, also 10:00am – 3:00pm. Stay all day or drop in for a couple of hours! Free admission to both but remember that parking at Steven F. Udvar-Hazy Center is $15. Book Signings – Tuskegee airman Col. Charles McGee will be at the Steven F. Udvar-Hazy Center on Saturday, February 28 from noon – 5pm. He will be signing copies of his book The Biography of Charles E. McGee, Air Force Fighter, Combat Record Holder. Col. McGee was one of the Tuskegee Airmen and a career officer in the United States Air Force for 30 years. He holds a US Air Force record of 409 fighter combat missions flown in World War II, Korea and Vietnam. He has such an amazing and inspirational story and it would be such an honor to meet him. So buy your book ahead of time so you can be armed with information! Or simply pick up a copy at the museum. Also, author George Norfleet will be at the Air and Space Museum in Washington, D.C. signing copies of his books A Pilot’s Journey: Memoirs of a Tuskegee Airman, Curtis Christopher Robinson and Training the Best. Both books are also available at the museum. He will be there February 13, 15, 17, 20, 21, 24, 27 and 28 from noon – 5:00pm. Even if you have not read the book, what an awesome opportunity to chat with someone who has extensively researched the history of the Tuskegee Institute and likely has tons of cool stories that never made it into the book! College Park Aviation Museum – Will host a presentation on Bessie Coleman on Friday February 13 at 3pm and 7pm. Admission is $7. Aviator Bessie Coleman was the first African American woman to earn a pilot license and stage a public flight in 1922! Let’s all take a moment to take that in… African American. Woman. Aviator. 1922!!! Wow. Such an inspiration! NASA Online – In honor of Black History month, a panel of African American engineers at NASA’s Jet Propulsion Laboratory in Pasadena, California will facilitate a discussion during a live online program on Wed., Feb. 24 at 1 p.m. Eastern/10 a.m Pacific. They will answer questions such as – What is it like to work at NASA? What jobs do engineers have on space missions? What classes should I take to become an engineer? These engineers manage many robotic space missions for NASA, including the Mars Exploration Rovers and the Cassini Mission at Saturn. This event is geared towards high school students but I’m sure anyone can watch and listen. Tune in live on the NASA/JPL UStream Web page at http://www.ustream.tv/channel/nasajpl to watch the 30- to 40-minute program. Classrooms are invited to email questions in advance to the panel. All questions must be received by Friday, Feb. 19 at 6 p.m. Eastern/3 p.m. Pacific. To submit a question, send it to education@jpl.nasa.gov. Please include school name, city, state, grade level and, preferably, student’s first name. No last names will be used. A few pre-selected schools may pose questions live to the panel. Such a great learning opportunity particularly for students in the process of determining their field of study. Well, that’s all she wrote! 🙂 While this time of the year is a great reminder to celebrate African Americans and their contributions to science, there is so much to learn and celebrate all year and across the nation. Researching for this blog post has been quite informative. I learned A LOT and I, personally, am looking forward to attending a couple of these events with my family. I hope to see you there! P.S. If you know of any events, not listed here, celebrating African Americans in science and technology pray do share! Please post here in the comments below, on the Facebook page, or follow me on Twitter. Let’s spread the word! Thanks! Happy New Year folks! I am so excited for what this year has in store and I am personally looking forward to a year of curiosity, exploration and discovery. There are plenty of fun and exciting science and technology centered events happening this year and the goal of this is post is to get you hyped and calendared for the bigger events, particularly those that will need tickets, registration or any sort of advanced planning! This post will also highlight some upcoming science competitions that kids can participate in. January 12 – NASA Goddard Optimus Prime Spinoff Challenge! This challenge actually opened up last year but all entries are due by January 12. Although this is a tight deadline if you are just finding out about it, it is worth a try if you can get your video completed. The challenge is for students in grades 3-12 to help share the benefits of NASA technologies by using NASA spinoff technologies to save lives and protect our planet. Such spin-off technologies were originally created for space and include the memory foam, artificial limbs, and aircraft anti-icing systems and so on. Students can choose from an exhaustive list, study it, create a video discussing their knowledge of said technology and how they would use it on earth and send in their entry! I know this is very short notice but it should be fun if you do decide to do turn something in! At the very least, you will be better prepared for the 2016 Challenge! I’m looking forward to my kid becoming eligible in 2016. And remember to be creative with your video entries. Check out these winners. February 4 or thereabouts – Doodle 4 Google!!! I LOVE THIS COMPETITION. This is what science is to a kid right? Imagination. Invention. Creativity. Cool factor. This yearly competition for kids in grades K-12 encourages students to submit their own creative interpretation of the Google logo. There is a different theme every year and the winning logo is animated and featured on Google’s home page. Prizes include $30,000 in college scholarship and a trip to Google headquarters in San Francisco… for which they will need a parent to take them right? Right?! THIS COULD BE YOUR KID! 🙂 So the competition went from February 4 to March 20 last year; this year’s dates have not been announced but go ahead and note it in your calendar. Also, I will be sure to post a reminder on the Where The Science Is Facebook Page or Twitter once the announcement is made. Another reason to LIKE the page and/or follow on twitter! Also in February or thereabouts – is the Google Science Fair 2015. For this, just go ahead and pencil in for the beginning of February so you can start to look out for a tweet or FB post from me, because… I’ve got your back! 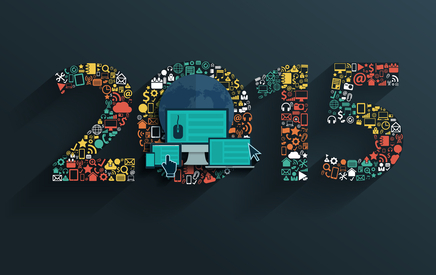 Details from 2014 are vast and rules-a-plenty. Exact date TBA. Eligible ages are 13 -18 years old. Prizes from 2014 included just a NatGeo Expedition… that all. There is also bragging rights and a long list of prizes. Again, THIS COULD BE YOUR KID! February 26 – Fans of StarTalk radio show and COSMOS will love this one! The one and only Neil deGrasse Tyson will appear at DAR Constitution Hall to speak to an audience about the wonders of modern science. This is a family friendly event and will use a visual approach to explain complex topics in a fun and accessible way. Children are encouraged to attend and to ask questions in a Q&A session that will follow. Tickets are still available and range from $65 – $88. You can purchase tickets here. April 25 – Robot Fest 2015! I told you I had some fun stuff. So, what had happened was… last year I stumbled on this event 2 weeks after it occurred and was quite sad I missed it. That will not be the case this year because I am all penciled in! Robot Fest is an annual event for anyone interested in the creative use of technology. This event will feature “roboticists, hackers, artists, hobbyists and makers of any age who have the unquenchable urge to develop and create new, previously unseen forms from lifeless electronics, fabrics and mechanical parts.” So. Much. FUN. See you there! Oh! The link I provided above is for last year’s event but the folks over there have informed me that the 2015 date is April 25. Also April 25 – Ugh. I hate when this happens. Yes, Maryland Day and Robot Fest are on the same day. Maryland Day is a fun, interactive, family friendly event, with live music and food, that is held annually at my alma mater, University of Maryland College Park. Yes, Duke alums are welcome. 😉 This is a huge event that is sectioned off based on topic; of particular interest is Science & Tech Way which will feature displays and topics such as laser technology, extreme robotics, a wind tunnel, outer space, modern electronic devices and the weather. Well, is it going to be Robot Fest or Maryland Day on April 25? Choose wisely! May 2 – Most people do not think of science and technology when they think of the Kennedy Center but you will be surprised by some of the hidden gems it offers. The upcoming NSO (National Symphony Orchestra) ensemble concert titled Connections: Science & Math + Music featuring Cellist and host Yvonne Caruthers promises to be quite intriguing. The program will show 26 ways (a full alphabet’s worth!) that math and science are related to music. Recommended for ages 9 and up. Tickets go on sale February 4 and are $20. Happy Holidays folks! So with the kids out of school in a few days and home for about a couple of weeks, what to do?! Well with Homeland wrapping up its season this weekend, you could binge watch The Fall or re-binge FNL but none of those are kid-friendly so how about you head out and do some science-y stuff! Winter is a perfect time to explore science centered events around you since it is usually too cold for outside activities. A lot of places are implementing cool science activities into holiday celebrations – code your own holiday e-greeting card, make a light-up greeting card using paper circuits, toy hacking, gingerbread city engineering, create a winter wonderland complete with glowing snow globe, and so many others. There’s also Elf Day and nanoscience?! Whooott?! 🙂 There is also regular, year-round, fun places to visit – Check out the list below. KID Museum – But of course! This weekend promises some great science fun. Some of featured events include coding your own e-greeting card using Scratch, make holiday cards or other paper gifts that light up using paper circuits, and an introduction to programming high-tech digital music lab equipment and recording your own music. These featured events are free with admission but registration is required. Go here to register. The regular stations and activities will also be available. 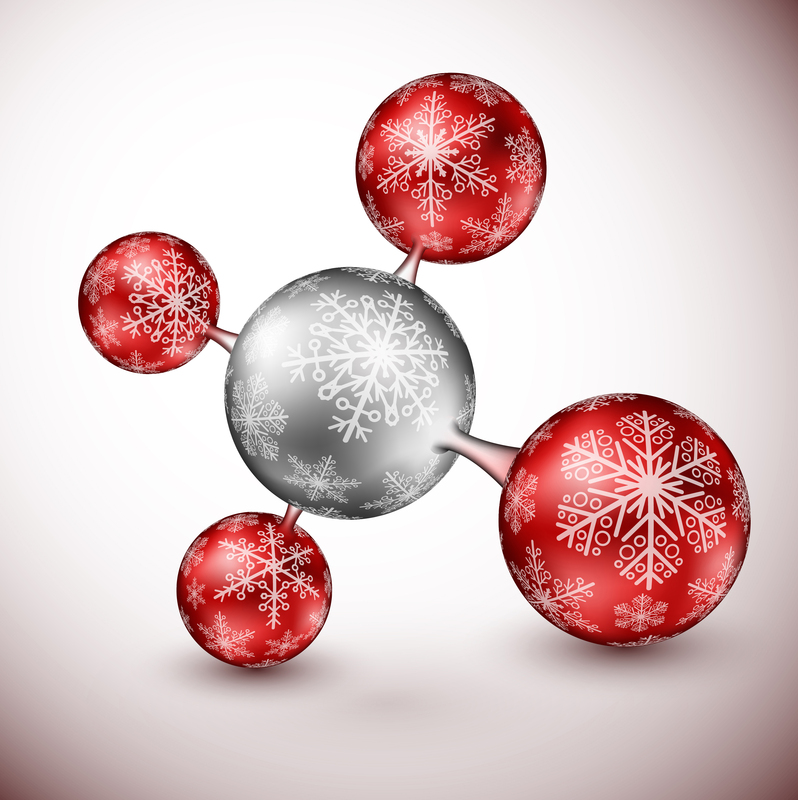 Maryland Science Center – The Maryland Science Center in Baltimore, MD event calendar is chock full of science-holiday fun the rest of the month! Most of these events are free with admission. Of particular interest is Elf Day with nanoscience, ginger bread city building, and toy hacking. Check out the December activities – Choose Wisely! Robinson Nature Center – This little gem is one of my go-to indoor places. Located in Columbia, MD and equipped with a digital planetarium, the Robinson Nature Center is a fun place to visit any time of the year. Watch a movie in the dome, enjoy star story telling about our constellations, and star gazing (weather permitting). Most of their special presentations require registration and a nominal fee. General admission is $5 for adults and $3 for kids (under 3 is free). Trains, Trains and Mo’ Trains – What’s with the holidays and trains anyway? There are lots of model trains and city exhibits to take in during the holidays. It allows you to appreciate the level of civil engineering that goes into the planning and construction of infrastructure. Check out the U.S. Botanic Garden for their yearly display and while you are at it take in some botany. Union Station has an excellent display and you can get in some Christmas shopping as well. College Park Aviation Museum with its miniature trains, villages, tunnels and depots is a lot of fun. This is likely to be the less crowded and tamer of the three. Free with admission – admission is $4 for adults $2 for children. This museum has a small display of planes for exploration. Kids can try on aviation gear and take in some aviation history; it is also an excellent play time. Note that this closes December 20. Other places with train displays are the B & O Museum in Baltimore and Ellicott City – both will have other holiday activities as well; and the Greenberg Train and Toy show at the Dulles Expo Center. Museums – I looovvveee the National Air and Space Museums. While they do not have holiday specific activities, this is an excellent time to visit or re-visit both the Udvar-Hazy Center in Chantilly, VA and the one in DC. You skip the summer crowd and get to take your time exploring all the goodies within. Both have lots of activities for kids and adults can catch a fantastic film in the IMAX theatres. In addition, there is the Smithsonian Tech Quest, an alternative reality game at the Udvar-Hazy Center that “will test your powers of observation, your problem-solving skills, and your decision-making abilities as you take on the role of an Intelligence Analyst. The game engages visitors through hands-on activities, interesting artifacts, and secret codes to locate a missing aircraft, recover the secret technology, and rescue the downed pilots.” It is aimed at kids 10 and above and but sounds like a lot of fun for adults as well! Other great museums to explore are the National Building Museum complete with the hands on building zone, and the National Museum of Natural History with dinosaurs to boot! So this is a lot of information and options to take in. I would pick one or two that is convenient or none if things get too crazy – no worries, this list will be here for reference! 🙂 If you do go, leave a comment will you? I will love to hear about your experiences. Wishing you and yours a restful and fun holiday! See you in 2015. For my first post, I am super excited to share with you my absolute favorite place to go with the kids …for the moment anyway. 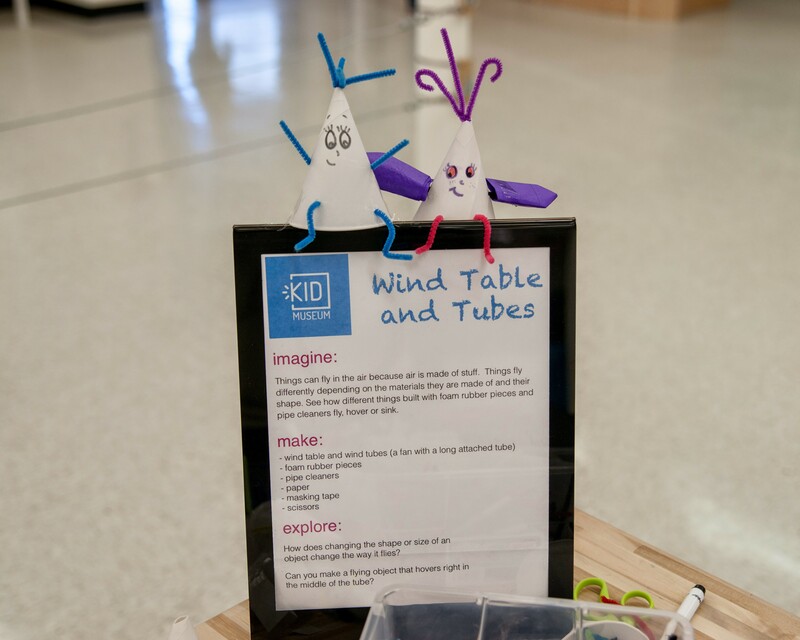 🙂 Imagine an open maker space, filled with tools and parts from various aspects of the sciences, designed specifically for kids, and you have KID Museum! Apparently, as I learned from a friend, there is a community of maker spaces emerging in the DMV area (DC, Maryland, Virginia area for my non-local readers). Maker Spaces are all the rage now – with the advancement of emerging sciences and technology, the STEMification of schools and the growing DIY science community, yes, Maker Spaces are a thing. Who knew?! Maker Spaces are exactly that – space where you make mostly scientific stuff. 🙂 So of course, I got to the Google-ing and I found KID Museum and fell in love! Armed with my 3 curious makers-in-progress/future-makers on a Saturday afternoon, we made the drive to Bethesda to go make some stuff! Upon entering KID Museum, we were greeted by a couple of very nice and enthusiastic staff members who explained to us how the “museum” works. Entrance fee was $8 a person; however, you could purchase a year’s membership which could be worth it if you planned on visiting several times during the course of the year. The layout of the space is very open with several stations – each station had a different activity. There was a coding station with several laptops with the Scratch Jr. program in use; a textile station where kids were making something with fabric; a wind station where kids made paper planes and “flying cones” to set them loose in a wind tunnel equipped with a tube and a fan; a beats studio where kids could experience audio engineering and create their own tracks and sound mixes; and a circuit table equipped with several circuit boards that could be connected for a variety of functions. There was also a kite making station, a station with wooden planks to build ramps and levers, and a couple of other activities we didn’t quite get to. It is note-worthy that they also have a 3D printer that was not open at the time but I am definitely, DEFINITELY, looking forward to checking that out on our next visit! All in all, this was a fantastic, fun, and engaging experience! The kids had a great time and so did I. There was lots of space to run around as well, which they did. A lot. There were tables and chairs on one side of the room where parents could sit and observe; some parents had books and laptops with them. Can you say Me Time?! 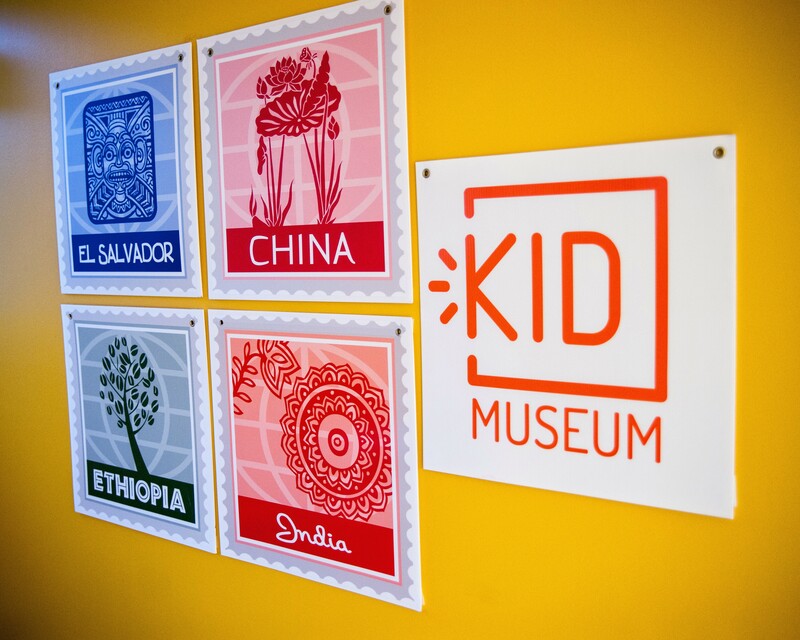 The staff at KID Museum mentioned that your entrance fee covered the entire day; so you could stay for a bit, leave for lunch and then return for more Maker’s fun later on in the day! We are already looking forward to our next visit and I am curious to see what activities they will have next- they change the stations and activities periodically. Hopefully, it will be something to do with that 3D printer! Drop a note if you make it out to Bethesda, will ya? I want to know what you think! I’m a self-described nerd. I’m also a mom. And. I. Am. OBSESSED! Obsessed about all things science! I’m constantly combing the vast spaces of the world wide web (okay, maybe that is an exaggeration – not really) in search of science centered activities and events for kids. This is the blog where you all benefit from my obsession. Where The Science Is is a science and technology blog aimed at kids, adults, families and anyone with a sense of curiosity about the science around them. This blog will serve as your “one stop shop” of some sort where you can find out what is going on in the science world in the Maryland, DC and Virginia area and other cities around our nation. I will also blog about some of the events we attend and upcoming events to get super hyped about; at least I do! The blog will occasionally feature events in other big cities as well.